Never Gonna Happen ~ Wine Cork Crafts. 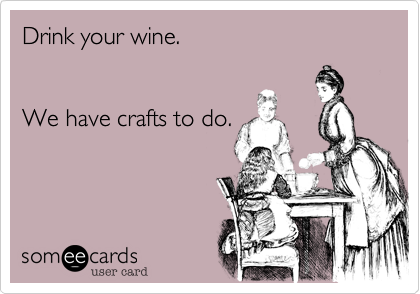 I am NOT crafty. It’s not that I don’t have the ability to BE crafty, it’s that I really don’t enjoy it. This discussion came up last while sitting on friends counter, going on and on and on and on about my new found love on minimalism. And in her kitchen sits a bowl of bottle caps and a vase of corks. We talked about the things she plans to do with them, create table tops and cork boards… and the truth is, I’ve always loved things like this. I would really enjoy having a little table top made out of mismatched bottle caps collected over months or years of friends getting together. or a cork board made special from the wines I’ve shared with them. But the truth, MY truth is that this is NEVER going to happen for me. I don’t enjoy DIY projects and sincerely doubt that feeling is going to change anytime soon. So could someone please explain to me why, for the love of God, I am still holding on to what has to be HUNDREDS of wine corks? Explain how somehow, despite all of my minimizing efforts around the house, I refuse to throw away, and continue to add to the cork collection. I totally just caught myself using the “it’s better for the environment” argument to hold on to a bunch of stuff. Specifically a multitude of coffee mugs. First I should confess that I love coffee mugs, I had a tendency to acquire them like a collection. So when I decided to move towards a minimalist lifestyle, I knew that I was going to have to get rid of a few. Not having actually counted, I believe the number was somewhere around…22. Bear in mind that I drink coffee at my home approximately once a week, if that. Now, I have pared down the collection quite a bit. I keep 8 10 in my cupboard right now, and recognize that’s probably still more than I need. Plus, aside from the 10 in my cupboard, I have another 7 or 8 that I keep in the drawer where I keep my lunch bag. These rotate in and out of the office. What if I kept one mug at the office and washed it? I know, crazy right? I told you it was a novel idea. It is a rare situation that holding on to too much stuff actually helps the environment. And it’s something I’ll be working through. I started this post yesterday and can say that today, I came to the office with 6 mugs and added them to the office cupboard. My hope is that the next time someone here reaches for a mug, they will use one that I have donated to the stash instead of paper cup. What’s more environmentalist than that? What are your justifications for holding onto excess stuff, or stuff that doesn’t suite you? In a quest to move towards a more minimalist lifestyle, I’ve recently started focusing on practicing detachment from material things. They are, after all, just things. So when I went on vacation and returned to find that I had somehow lost my favorite dress, I had some new issues to deal with. Our group on the trip was large, eight of us total, but only one other girl. So I called her and asked if she had accidentally grabbed my dress, she had not. I called the hotel, they didn’t have it either. Damn. I realized that I had to come to terms with the fact that it was gone. Normally, this would have been quite upsetting. However, as I was trying to practice detachment, I reminded myself that it was just a dress, just a piece of fabric and it had no real significance to me. I let go. I detached. I moved on. And as soon as I had done so…I got a text from one of the guys on the trip. He had gone back to check the hotel room one more time, saw the dress, grabbed it and forget to tell me about it. I got my dress back yet held on to the lesson in detachment.